I reported about this last year, but a new radio report about my father's career gives me an excuse for a re-visit. The Man Behind the Maneuver, produced and reported by Pat Walters, aired last week on a program called Radiolab. Four beagles, weighing 17 kg (38 lb) each, were anesthetized with thiamylal (Surital) sodium given intravenously. A cuffed, No. 32 endotracheal tube, the lumen plugged by a rubber stopper, was inserted under direct vision through the mouth into the larynx. The cuff was distended with 3 to 4 ml of air, causing total obstruction of the trachea, simulating a bolus of food caught in the human larynx. The animal immediately went into respiratory distress, as evidenced by spasmodic paradoxical respiratory movements of the chest and diaphragm. ...Subsequently, I pressed the palm of my hand deeply and firmly upward into the abdomen of the animal a short distance below the rib cage, thereby pushing against the diaphragm. The endotracheal tube (bolus) popped out of the trachea. After several labored respirations, the dog resumed breathing. The experiment was repeated more than 20 times on each animal with the same result. The clinical situation was then simulated by inserting a bolus of raw hamburger into the dog's larynx until the respiratory passage was totally occluded. The abdominal pressure maneuver was repeated and, in each instance, after one or two compressions, the bolus was ejected from the larynx and normal respiratory exchange was established. Incidentally, there's no mention of string being tied to the meat and it's unclear how a piece of string could be tied to "a bolus of raw hamburger." 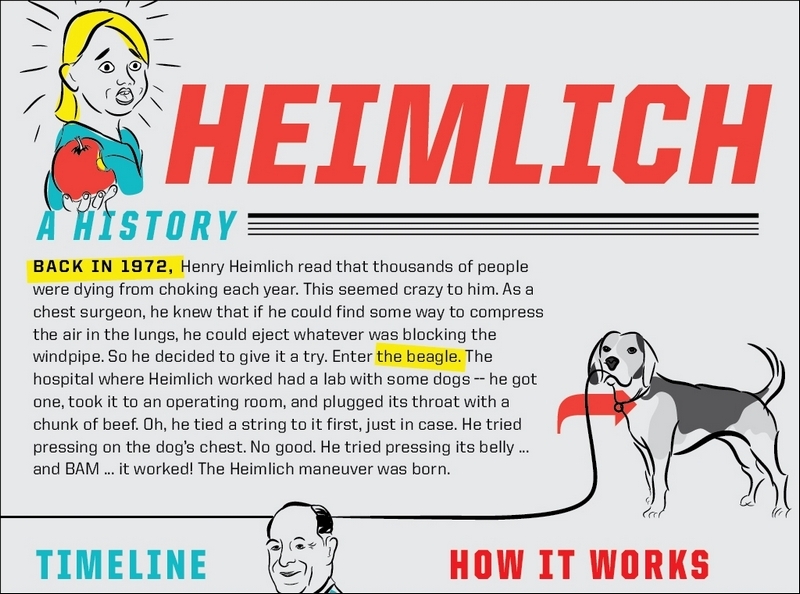 What makes this more interesting is that, according to the LA Weekly, since 1986 my father's been on the medical advisory board of the Washington, DC-based Physicians Committee for Responsible Medicine (PCRM) and every couple of years PCRM presents the Henry J. Heimlich Award for Innovative Medicine. Dr. John Pippin, director of academic affairs for PCRM, said the group’s interest is scientifically and medically based. Since his 1974 research using the beagles, my father has claimed to have seen the errors of his ways and has represented himself as an advocate against the use of animals in medical research. This useless sacrificial research can be stopped if we take time, and use the press, which is very friendly. 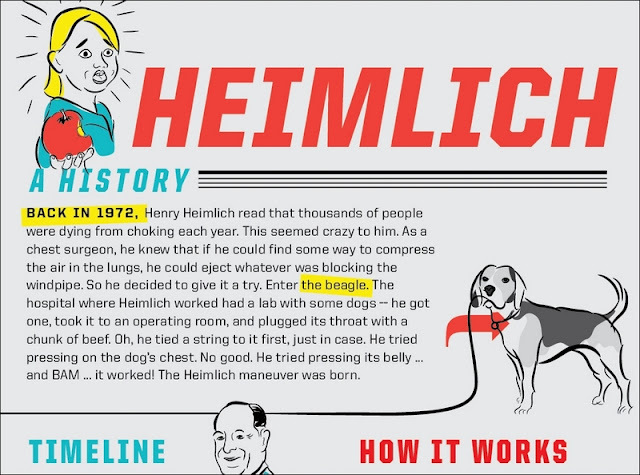 However, only a couple of years ago, my father's Heimlich Institute donated $615,000 to the University of Cincinnati for cancer research using mice. 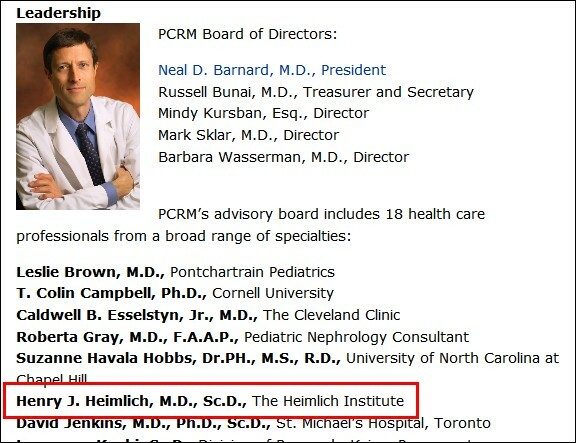 As I reported, PCRM then quietly scrubbed the Heimlich Institute from their list of approved charities. Here's a good question that animal activists may wish to ask Dr. Pippin and PCRM founder/president Neal Barnard MD. Why is my father still on their organization's board? A request to Sidebar readers: Over the years, I've sent a number of courteous inquiries to Drs. Pippin and Barnard and PCRM's media representatives, but I've never received a single reply. If anyone wishes to ask PCRM for an explanation why my father is still on their board, I'd welcome copies of any correspondence. Click here for PCRM's contact information. Click here for mine.